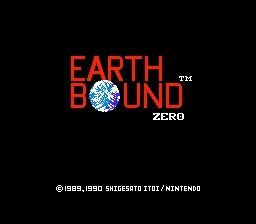 Writer's Note: Since writing this EarthBound Zero was finally released on the VC as EarthBound Beginnings on June 14th, 2015. Writing about a game like Mother is interesting, at least for me. 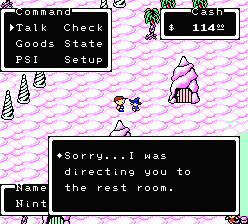 On one hand, the game is the predecessor to my favorite RPG of all time, EarthBound, and when playing it you really get to see the genesis of the franchise’s hallmark weirdness and surreal tendencies. On the other, the game has some deep flaws which make the game often times very hard to play without lots of frustration. 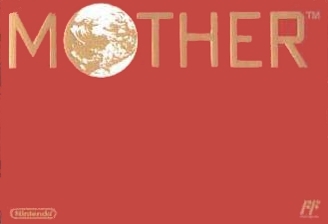 Mother was a game that was developed within a year of being pitched by Shigesato Itoi and it shows but it still has a lot of charming and unique points that make it worth the playing through if you can weather the game’s flaws. This review is going to be based on the never released English version so names of areas will be based on that. Writers Note: I have seen nothing to indicate that EarthBound Beginnings differs in anyway from the EarthBound Zero rom. So presume everything in this review relates just the same. The year is 1988 and strange paranormal events are afoot in the town of Podunk. After a night where he, his mother and sisters are attacked by possessed inanimate objects young Ninten’s father calls him with information regarding his great-grandfather’s studies regarding PSI and that the strange occurrences happening all over the area might be related to this. Thus Ninten is sent on a journey to find out what cause of the problem and save the world. Being set in a contemporary, “modern” setting of a facsimile of the USA at the time, Mother was quite unique for the time as most RPGs of any sort had the typical medieval fantasy setting. This stark contrast in setting is one of the strength’s of Mother as it sets up a world that is unique in gaming and familiar to the player and provides an often surreal experience that you really can not get from any other RPG. As an RPG Mother’s gameplay does not break a lot of new ground. Much like the game that it shares a lot of similarities with, Dragon Quest, Mother features fairly conventional tropes of the genre. You grind for experience points, upgrade weapons and armor as you go and go from town to town fighting enemies and gathering your allies. As you go more and more of the story is opened to you and uncover bits and pieces of the mystery surrounding you. So pretty standard stuff. Battles are fought in the first person with options like “Bash” and “PSI” replacing the standard “Attack” and “Magic” commands. When you win you collect a certain amount of experience (divided up between characters) and money, which is sent to your ATM account. 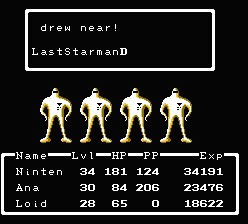 Your party will consist of three characters at any given time and include: Ninten, your strongest fighter as well as your healer and support magic provider, Loid (yes) who can not use any PSI but is able to lasers, bombs and bottle rockets and Ana who wields powerful PSI attacks. A fourth character Teddy has strong physical attacks and no PSI but is with the party for a very short while. A weird thing with the game is the relative lack of equipable items you collect. The characters each have their own specialty weapon (bats, pans, beams and blades) and they can all equip slingshots. Attack strength for everyone but Ninten will be low because while Ninten has a decent selection of specialty weapons both Ana and Loid have only two or three per and they do not get their strongest weapons till late in the game so you’ll be scrapping by with those two fairly weak characters. 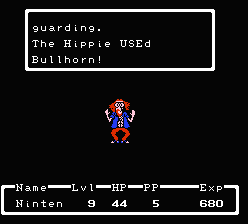 Also you can get the strongest defensive items very early on and it doesn’t take a long time to buy any of them as Ninten’s father is rather generous in doling out money to your ATM account after every battle. And you will need those defensive items as soon as possible because this game is tough as nails at times to the point of being severely unbalanced. While RPGs of this time were known for being rather tough I really think Mother outdoes them all by a fair degree. You will have to grind and grind and grind some just to survive any given area, especially after getting a new character who all but Teddy start at level 1, and the game is very stingy in how much experience you get per enemy and even when you are fairly leveled up you can still be killed pretty easily if you do not pay attention to who you are fighting. Even with the general lack of boss fights (I think 3 throughout the whole game) some of the enemies are as tough as any boss in many RPGs especially later on. Near the end I got to a point where I was running from every fight in a mad dash to survive and make it to the final areas. In can get rather frustrating getting so easily pummeled especially with the very numerous random battles you will get yourself into. Fortunately when translating it over, NoA added a very handy run button (which actually just speeds up the game world) which makes getting through some areas a bit easier. All in all, getting very far in Mother can be a very daunting experience and it took me several false starts to finally get the hang of it. Though with enough perseverance you can make it past most of those hurdles even as they get harder to jump over later on. Also I feel like I have to discuss the inventory for it is tiny only 8 slots. Fortunately whatever you have equipped will not be in your inventory but it can be frustrating trying to figure out what you can or can not brings with you. It is fortunate that there aren’t very many key items more spaces would have been very much appreciated. On the other hand it does make you have to think about what you are carrying at all times and plan accordingly. 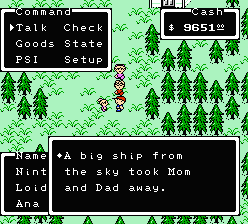 Finally the translation is also fairly well done, especially for an NES game. The team who translated it did a seemingly good job of capturing the weird tone that many conversations in that tend to come about in the Mother series and considering that typically the biggest thing lost in games is that feel from Japanese (as far as I know since I do not speak Japanese at all) to English so that is something that ought to be applauded. As far as visuals go I’d say Mother is kind of bland. While the graphics do an okay job of presenting the American ambience they were going for, a lot of the areas in the game are kind of sparse. This was 1989 with companies making some very good looking NES titles so Mother’s ages the game more than its contemporaries. 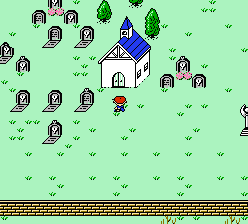 There is one very interesting thing the game’s graphics do allow for and that is almost seamless transitions from Ninten’s home in Podunk to the entrance of Mt. Itoi. It is a rather impressive bit of design since Mother eschewed the zoomed out over worlds of RPGs prior and it does give the world a rather cohesive feeling that you do not often get in the genre. The battle scenes are generally pretty basic featuring a black background with the nicely detailed enemy sprite but otherwise there isn’t a whole lot to say about it since nothing is animated about it. Where the game really shines as far as presentation goes is the music. Some of the best sounding NES music I’ve ever heard is on this game and many of the songs that are heard in Mother show up in the next installments. The songs range from upbeat and cheery to rather somber to creepy to outright weird while sounding very different from what you got from other RPGs at the time, a trend that has continued with each subsequent game. The songs, more so than the graphics, set the mood for the game I feel and truly make for a memorable experience. In the end Mother is an RPG of its era. It is hard to recommend with caveats because of the unbalanced difficulty found throughout the game but at the same time it is a rather memorable experience that provided something truly different for other RPGs of that time. While it may not be for everyone it is an interesting peek into the proto-EarthBound as both those games share several key elements and as a big fan of EarthBound it was interesting see where many of those elements originated and how they were initially conceived. Thankfully the developers of Mother would learn from their experience with Mother and improve on the idea and give us what I consider to be one of the greatest RPGs of all time. Hmm, guess it was still a little early to post this with all the e3 buzz. I'll read it later Chris! Don't worry! Read it earlier at work and intended to post, I promise! Great review! I hear Earthbound Zero tries to balance some of the grindiness, though I've never played either version so who knows? I do absolutely love the music. The Eight Melodies is damn near awe inspiring. Will read later. In the meantime, here is an alternative to the music link posted. The sound channels are all split up into a stereo mix. Sounds heavenly. the biggest thing lost is that feel from Japanese (as far as I know since I speak Japanese at all) to English is something that ought to be applauded. Otherwise great review, gave me a good idea of what to expect and seeing as I will probably never try EB0 gave me an idea of how improved EB is over its predecessor. I couldn't quite say how much but if the lightened up the random battles, enemy difficulty and upped the experience earned per enemy and the game was still was brutal I can't imagine how hard the Famicom original version. Also NoA, along with the run button, added some ending stuff to wrap up the game which were held over in the GBA ports so obviously they did something right when translating the game here. Though I'd love to see the manual the game was supposed to come with as well as the map. They were doing what they did for EarthBound for Mother at the time. I'd guess that the reason they made it so hard was because they felt it'd be too short otherwise. And though it may have been shorter than other RPGs of the time, its uniqueness would have made up for it, and it isn't like there weren't plenty of other types of NES games that were really short. It also would help if Teddy stayed in your party and you had four members, I know there are story reasons this doesn't happen and for why Loid is so weak, but it's a little ridiculous as is. I don't think I'll be playing this one again. I've read that Itoi admits that it wasn't well balanced since the game was completed within a year from initial pitch to finish and for a RPG that is not a lot of time even for a simpler RPG. I really don't blame you for not wanting to play it again. I probably won't because of the frustration factor. I'm glad I did but the game is a rough play. 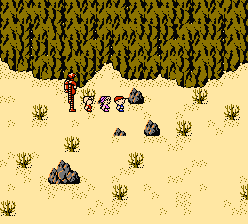 Though I would totally be for a remake that not only brings balance to the difficulty but maybe expands things, but that doesn't seem likely as Itoi has pretty much said he is done with Mother and the only way we are getting any new Mother related games is through fan work. Speaking of which the Mother 4 fan game looks to be coming along nicely. Gotta wonder if it'll be any good. Because we finally got Earth Bound released on these shores. Thanks for the review! I'll be getting this one and starting my Earthbound journey from the beginning. Is the Wii U version the American version with the added stuff, including the run button or is it just the Famicom version with a new translation? American version. Run button and old translation. Yep it looks like they took the near or 100% complete version originated the EB0 rom and just put it on the VC. Which is fine. Heh I just realized I posted this review almost to the day it was released. What are the odds? @chrisbg99 Hm... 1 in 365 or 366? It was also exactly two years after your last post!